There’s been two interesting articles on hybrid Digital Asset Management systems this week: Jeff Lawrence’s Finding the Perfect Balance Between SaaS and In-House DAM, and Ralph Windsor’s Combining On-Premise And SaaS DAM Strategies. The primary benefit of a hybrid DAM is fast internal file transfer because the files remain inside the local network. So let’s assume the asset files (images, PDFs, videos etc.) are stored on a local server. That local server will also deliver the files via a simple Web server, and run minimal file processing software to be able to ingest files and accept uploads, create renditions and extract file metadata. Upload and ingestion will be a two-step process with the files going onto the local server, which then sends all metadata to the cloud DAM (to put it into its database and search engine index). Instructions for creating renditions (how many, how large) can be fetched from the cloud. 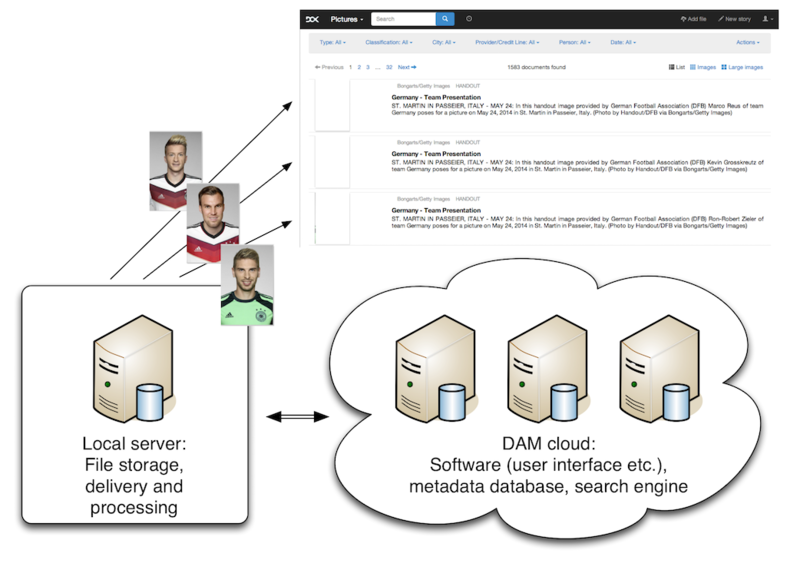 We’ll now have decoupled “software as a service” from “storage as a service”: The storage, delivery and processing of files is cleanly separated from the DAM software, the metadata database and the search engine index. The latter – which require a lot more ongoing maintenance (software updates, search performance tuning etc.) – will nicely be dealt with by the DAM provider in their cloud. The local file server component can be installed relatively easy, or run from a pre-packaged virtual machine appliance or even a hardware offering (“your local DAM storage box”). Now what about distribution of assets to the outside world which doesn’t have access to your local network? If you expect low traffic, your local file server could be made available on the Internet and directly serve the files. Or files to be distributed could be copied to Internet-connected storage (in the DAM cloud or at any other storage provider). Maybe you’ll just want to copy smaller renditions of the files into the cloud, and redirect download requests for large files to your local server. If you wanted to get really creative, imagine the local server software running directly on your Windows or Mac client computer. Asset files could remain on your hard disk, while the heavy DAM machinery runs in the cloud. Or the “local server” would actually be running in a different cloud. With the protocol between DAM cloud and local server being open and well-documented, there could be multiple interoperable implementations. How about a distributed, “peer-to-peer” DAM with many local servers contributing to the same DAM cloud instance?